Offer the most comprehensive range in LED Neon Flex, with unique designs like Dome, Mini Dome, Square, Flat & Round LED Neon Flex. All product are IP67 rated and available in 220V, 12V & 24V to match customer's requirement. Standard warranty of 2 Years for all products. Owing to our vast industry experience in this domain we are devoted towards offering supreme quality 12W Dome LED Neon Flex Light. In order to ensure quality of this light our team of experts tests the entire range on different parameters in order to deliver high quality product range. Apart from this, we offer our entire range in diverse sizes, in order to meet the requirements of clients. In addition, clients can avail this light from us at affordable prices. 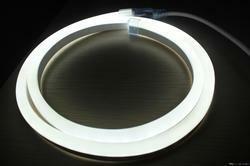 Looking for LED Neon Flex ?